Bougainville 2015 Election News : Do you qualify to be Bougainville President or Member of the House ? Candidates intending to contest in this year’s ABG General Election are urged to consult the qualifying requirements for candidates before contesting in the election. While issuing this call on Monday, the Acting ABG Electoral Commissioner George Manu stressed that this is to avoid court battles that may arise following the declaration of a candidate that is not qualified to contest in a particular seat. He said intending candidates must come and check with us so we can advise you on what requirements you must fulfil before you can qualify to contest in the constituency, former combatants, regional women’s and presidential seats. He then pointed out that according to the ABG Constitution, a member of the House of Representatives must not be less than 25 years of age and candidates intending to stand for election must also be qualified to vote in the elections of the Bougainville House of Representatives. He added that in order to contest in one of the 33 constituency seats, a candidate must be a Bougainvillean and be a member of a clan lineage that holds land in the constituency for which the candidate wishes to nominate. Mr. Manu went on further saying the candidate must also have been in that constituency for at least five years immediately prior to nomination. As for the regional seat for women, a candidate will be eligible to contest if she is a Bougainvillean and be a member of a clan lineage that holds land in that particular region that she will be contesting in. He said the woman candidate must also have resided continuously in that region for at least five years immediately prior to nomination. And for those intending candidates for the three regional seats reserved for the former combatants, the requirement is that they must be a Bougainvillean and a former combatant. The candidate must also be a member of a clan lineage that holds land in that region that he intends to contest and that he must also have resided continuously in that region for at least five years immediately prior to nomination. On top of that the acting commissioner stated that the candidate’s nomination must be endorsed by twenty other former combatants from that region. And in the presidential seat, the candidate must not be less than 40 years of age, is a Bougainvillean and is qualified to vote in the elections of the Bougainville House of Representatives. According to the Bougainville Constitution, a Bougainvillean is defined as a person; • who is a member (whether by birth or by adoption according to custom by the clan lineage) of a Bougainvillean clan lineage (matrilineal or patrilineal) owning customary land in Bougainville; or • who is married (whether by law or custom) to a person regarded as a Bougainville; or • Who is a child one of whose parents is a Bougainvillean as per the above definition Intending candidates are advised to check with the Assistant Returning Officers or the regional returning officer to get more information on these requirements. Below is an extract of section 56 of the Constitution of Bougainville that details the qualifications of candidates that are eligible to contest for the constituency, women and former combatants seats. 56. QUALIFICATIONS FOR AND DISQUALIFICATIONS FROM ELECTION. (1) A member of the House of Representatives must be not less than 25 years of age. (2) A candidate for election to the House of Representatives must be qualified to vote in elections to the House of Representatives. (c) have been born in that constituency. (b) have resided continuously in that Region for at least five years immediately prior to nomination. and have his nomination supported in accordance with Section 58(1)(d) (mode of nomination) of Schedule 10 (electoral provisions relating to the first general election of President of the Autonomous Bougainville Government and members of the House of Representatives) or with the Bougainville law referred to in Section 106 (Bougainville Electoral Commissioner and elections generally). (b) for the office of President. (d) he or she has been declared bankrupt by a court of competent jurisdiction and remains bankrupt. (b) if an appeal is lodged within the period referred to in Paragraph (a), the appeal is determined. (9) The references in Subsection (8) to appeals and to the statutory period allowed for appeals shall, where there is provision for a series of appeals, be read as references to each appeal and to the statutory period allowed for each appeal. (b) the writ for the by-election has not been issued-the member is restored as a member of the House of Representatives. definite period granted or that may be granted unless it was granted within that definite period. (12) Nothing in this section is intended to reduce any right conferred by Section 50 (right to vote and stand for public office) of the National Constitution, but it is the considered opinion of the People of Bougainville, expressed through the Bougainville Constitutional Commission and the Bougainville Constituent Assembly, that any restrictions imposed by this section are reasonable and are reasonably justifiable in a democratic society having a proper regard for the rights and dignity of mankind. An extract from section 91 of the Bougainville Constitution detailing the eligible criteria for those intending to stand for the presidential seat. 91. QUALIFICATIONS FOR AND DISQUALIFICATIONS FROM ELECTION AS PRESIDENT. (1) Until a Bougainville law made by an absolute majority vote provides otherwise, a President must be not less than 40 years of age. (2) A candidate for election as President must be qualified to vote in elections to the House of Representatives. (3) A candidate for election as President must be a Bougainvillean. (i) if the election is an election for President under Section 58(5)(d) (recall of member of the House of Representatives) and the person is the person whose recall is the subject of the poll under Section 58(5)(c) (recall of member of the House of Representatives). (5) Nothing in Subsection (1) is intended to reduce any right conferred by Section 50 (right to vote and stand for public office) of the National Constitution, but it is the considered opinion of the People of Bougainville expressed through the Bougainville Constitutional Commission and the Bougainville Constituent Assembly, that any restrictions imposed by this section are reasonable and are reasonably justifiable in a democratic society having a proper regard for the rights and dignity of mankind. 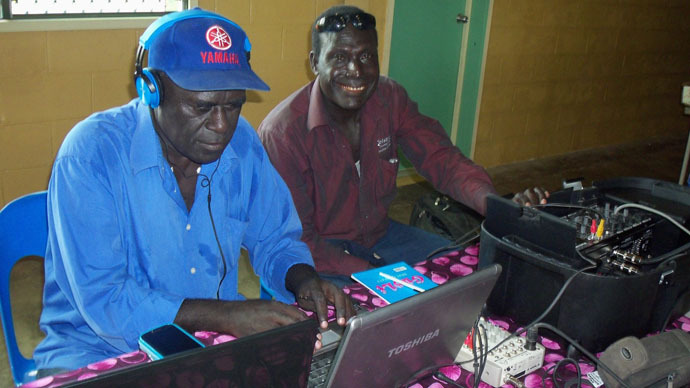 The New Dawn Video Awareness Program project will engage Bougainville’s citizens in a nationwide video-based campaign to improve the country’s understanding of the Bougainville Peace Agreement. Since its establishment in 2001, consultations have continued between the community and the government to ensure parties uphold the Agreement. This will however, be the first use of audio visual education in these efforts. Supported by the PACMAS Innovation Fund, the project developed by New Dawn FM, an independent community radio broadcaster, will produce six educational videos in Tok Pidgin language on Disarming, Referendum and Good Governance – the three pillars of the Peace Agreement. Other sensitive issues that will also be covered are missing persons, war widows, and government corruption. The 15 – 30 minute informational videos will be screened across the country, targeting the three district centres of Buka, Arawa, and Buin as well as key rural locations. The live screenings will provide opportunities for discussions and debates on issues such as gender equality, empowerment of women, good governance and democracy. Online deliberations will also be encouraged with New Dawn FM sharing the videos on YouTube, Facebook, Twitter and Typepad. DVDs, mobile phones, and USBs will also be used for distribution. Goal: Raise awareness about missing persons, war widows, government corruption and the three pillars of the Bougainville Peace Agreement. providing opportunities for Bougainvilleans to engage with democracy not just as citizens but also as contributors to the media. The New Dawn Video Awareness Program activity contributes to Bougainville’s ongoing development of a free and open democracy and aligns with the PACMAS Media Content component, as well as PACMAS’s overall goal of supporting better governance in the Pacific region by contributing to the development of a diverse, independent and professional Pacific media system. To view the full project profile please click New Dawn Video Awareness Program. There are currently many questions on Bougainville’s unity but this unity cannot happen with the imposition of uniformity amongst the people. Autonomous Bougainville Government President Chief Dr John Momis expressed this sentiment during a Seminar hosted by the University of Papua New Guinea Bougainville Students Association themed Gathering Intellectual Capacity toward our Journey to Referendum. “The only intelligent and legitimate way of bringing about unity is to create a structure that empowers people and recognizes the important principal of subsidiarity and only then will we work together in solidarity,” President Momis said. “Human solidarity will only come about when we recognize the differences between us and the importance of working together,” he added. The President said the people of Bougainville have a vision and that is to reject corruption, they are rejecting manipulation, they are rejecting the syndrome of dependency and they are rejecting disempowerment and injustice. “People are demanding the right to forge a new society based on natural justice and perennial principals that outlast any political or economic system,” he said. President Momis also warned that people who are not imbued with such a vision are very dangerous, they maybe skilled but their skills will be abused and misused against the very society which they are called upon to build. 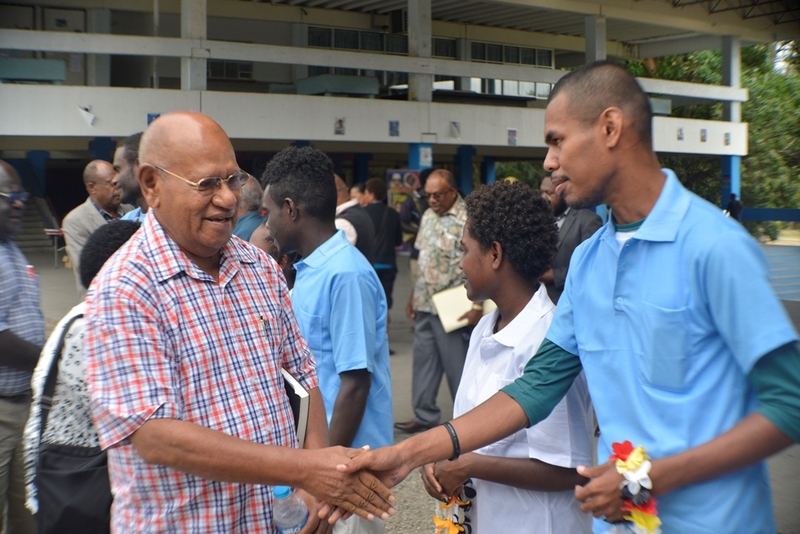 President Momis told the students that it is very important that education institutions must put a lot of emphasis on human formation. “People must be formed on perennial values that outlast any of the pragmatic things that people are pushing in the world today,” he said. “Bougainville as we discern the signs of the times, it is quite clear what the people want; they want to be intelligent active agents of change and mere passive reciepients of benefits,” the President said. President Momis said this does not mean the people of Bougainville want to do things on their own but it means they want to take an active part in development and to be engaged in an intelligent and collaborative manner. Amongst the key speakers at the seminar were several Bougainvillean leaders such as the Regional Member, Joe Lera and former Minister for Mining, Sam Akoitai as well as UPNG Vice Chancellor, Albert Mellam and several Bougainvillean students. 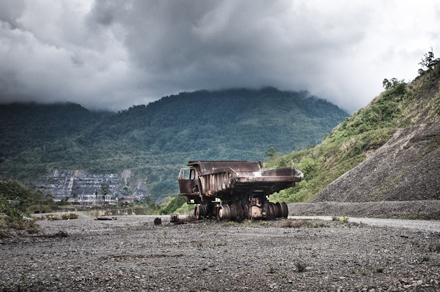 A lone copper dump truck that was completely burned out during the crisis at Panguna mine. Photo by Ian Booth. Autonomous government needs to weigh the cost and benefits of extractive industries, writes MATTHEW ALLEN. The recent passage of new mining legislation on Bougainville comes at an especially troubling time for large-scale mining operations in the Western Pacific. One of the first major laws to be enacted since the transfer of a suite of powers to the Autonomous Bougainville Government under the terms of the 2001 political settlement with Papua New Guinea, the transitional mining law is a significant step towards the possible recommencement of large-scale mining on the island. However, an assessment of how some of the region’s largest mines have been travelling in recent times makes for sobering reading and points to the need for deep and careful reflection as Bougainville contemplates a mining future. The report card reads like this. 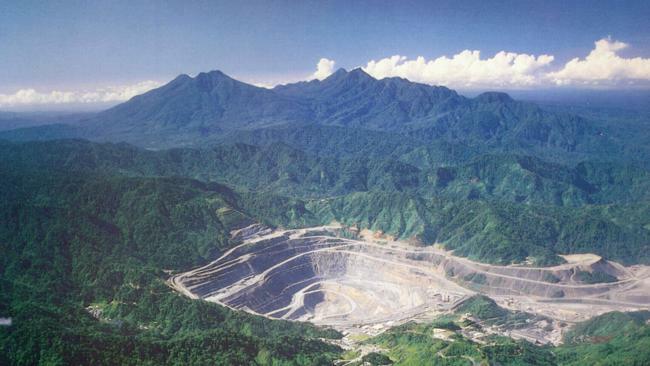 In April of this year the PNG government declared a state of emergency at the Porgera gold mine in the highlands province of Enga – operated by the Canadian miner Barrick Gold – and launched a three-month operation to stamp out what it describes as “illegal” mining. Over a hundred police and military personnel were deployed to the region and hundreds of houses allegedly belonging to illegal miners were razed by security forces. Two weeks ago the Chinese-owned Ramu nickel mine, also in PNG, was reportedly attacked by “armed villagers” resulting in injuries to five Chinese workers, damage to equipment and a three-day halt to mine production. Late last year the PNG government effectively expropriated the lucrative yet environmentally and socially problematic Ok Tedi mine in Western Province, a move that remains the subject of a court challenge in Singapore. In neighbouring Solomon Islands, the country’s only mine, Gold Ridge on north Guadalcanal, has been closed since the site was flooded during heavy rains in April. The Australian operator returned staff to the site in June but has recently pulled out again citing a serious escalation in security incidents and the presence of large numbers of “illegal miners” in the mine lease area. Further south in New Caledonia, the Vale nickel mine in the Southern Province was closed for several weeks earlier this year following a chemical spill that triggered a series of fatal clashes between riot police and Kanak youth. Unfortunately there is nothing particularly new about this association between large-scale mining and violence in Melanesia (and nor is it peculiar to the region – a 2009 United Nations study found that at least 40 per cent of intrastate conflicts globally are related to natural resources). Gold Ridge mine was a flash point during the so-called “ethnic tensions” that gripped Solomon Islands in the late 1990s, eventually closing down as a result of the violence. And of course local grievances associated with Rio Tinto’s giant Panguna copper mine on Bougainville were a major contributor to the 10-year civil war in which thousands died. The mine has remained closed since the conflict, but Rio Tinto’s subsidiary, Bougainville Copper Limited (BCL), had, until the passage of the new legislation this month, retained its mining lease under PNG law. Bougainville’s political leaders are in the unenviable position of having to weigh the costs and benefits of a mining future. At the forefront of their minds is the prospect of a referendum on full independence from PNG which, according to the autonomy arrangements, must take place between 2015 and 2020. A key question is whether an independent Bougainville can be economically viable without large-scale mining. The avowed policy of the ABG’s current leadership is to actively explore the possibility of at least one large-scale mine, with the preferred candidate being the mothballed Panguna mine. The need for the ABG to be able to regulate Bougainville’s mining sector has been given added urgency by the increasing activities of foreign investors with questionable credentials and intentions, as well as by the recent boom in small-scale and artisanal mining activities. There are aspects of the new mining law that are innovative and clearly informed by the problematic history of the Panguna mine and the legacy of the conflict. For example, the legislation vests the ownership of mineral resources in customary landowners, who can veto exploration but not mining once an exploration license has been granted. It also contains provisions for the development of the island’s poorer regions. That said, the legislation has not been without its detractors – in large part reflecting the highly fragmented character of Bougainville’s politics – with the parliamentary debate and subsequent passage of the bill met with an outpouring of opposition across mainstream and social media. Opponents claim that the new law gives privileged treatment to BCL, which loses its mining lease but automatically gains an exploration license and therefore the right to negotiate for a new mining lease. Other critics have long maintained that Bougainville should follow a path to development based on smallholder agriculture and artisanal mining rather than large-scale mining. For its part BCL’s chairman Peter Taylor has described the new legislation as a “set-back” and Rio is to review its majority shareholding in BCL. Whatever the legal status of BCL’s claim, the history of mining on Bougainville and elsewhere in Melanesia shows us that no new mining is likely to take place without the agreement of landowners, and such agreements are open to frequent renegotiation. One thing we can be certain of is that despite demonstrable economic recovery, Bougainville’s social and economic development indicators remain well below pre-conflict levels. There are pressing human development needs on Bougainville, which only heighten the urgency of the tough choices that must be made about its economic future. Matthew Allen is a fellow at the State, Society and Governance in Melanesia program, ANU College of Asia and the Pacific. He is conducting research on mining and political change in Melanesia funded by the Australia Research Council. An increased flow of information will be provided to Panguna landowners and other Bougainvilleans as they give consideration to a re-opening of the former copper mine, says the co-chair of the joint Panguna Negotiations Coordination Committee, Raymond Masono. He said this is part of a strategy to ensure that Bougainvilleans are at the centre of decisions about the mine’s future. “The exclusion of Bougainvilleans from decisions about development of the Panguna copper mine was a key cause of the Bougainville conflict. “This is why customary landowners, the Autonomous Bougainville Government, the National Government and Bougainville Copper Ltd (BCL) are adopting a very different approach in considering whether the mine should be reopened,” said Mr Masono. Prime Minister O’Neill and the Chairman of BCL, Peter Taylor, agreed with Bougainville President John Momis that strong support from the ABG and affected landowners is essential if the mine is to reopen. “This is very different to what happened in 1969, when the key decisions were made by the Australian Colonial Administration and the mining company, which was then CRA Ltd,” Mr Masono said. The transfer of mining powers from the National Government to the ABG and the development of Bougainville’s own mining legislation, are critical in ensuring that Bougainville is in control. The other big change is that all of the major stakeholders will be closely involved in negotiations about the future of the mine, and will have access to the information they need to deal with the legacies of earlier mining and plan for the future. “The JPNCC has been created to make sure that this happens,” Mr Masono said. The JPNCC is a partnership between Panguna-affected landowners, the ABG, the National Government and BCL. A key role of the JPNCC is to undertake baseline studies designed to establish the state of the environment, and existing social conditions, in areas surrounding the Panguna mine. These studies, which will be conducted over the next 12 to 18 months, are essential to deal with the impacts of earlier mining and to inform decisions about whether the mine should be reopened. “If people are to have trust in the findings of baseline studies they must be conducted independently, transparently, and to the highest technical standards. “The JPNCC will ensure that this happens,” he said. He said much remains to be done to improve communication of information about the baseline studies and other preparations to Bougainvilleans. “An ABG survey of communication channels, both formal media and informal transfer of information, confirmed that people outside Buka have very limited access to mainstream media, including radio, television and newspapers,” he said. “In response to these findings the JPNCC is developing a communication strategy focusing on face-to-face communication and delivery of print materials that are designed specifically to suit Bougainville conditions”. THE people of Tonsu constituency in the west coast area of Buka Island recently witnessed the launching of the New Bougainville Party’s Tonsu branch. The ceremony which was held at Petats Island last Wednesday was attended by party leader and President of the Autonomous Bougainville Government, John Momis and his cabinet ministers, party president Linus Sahoto and other senior members of the party. 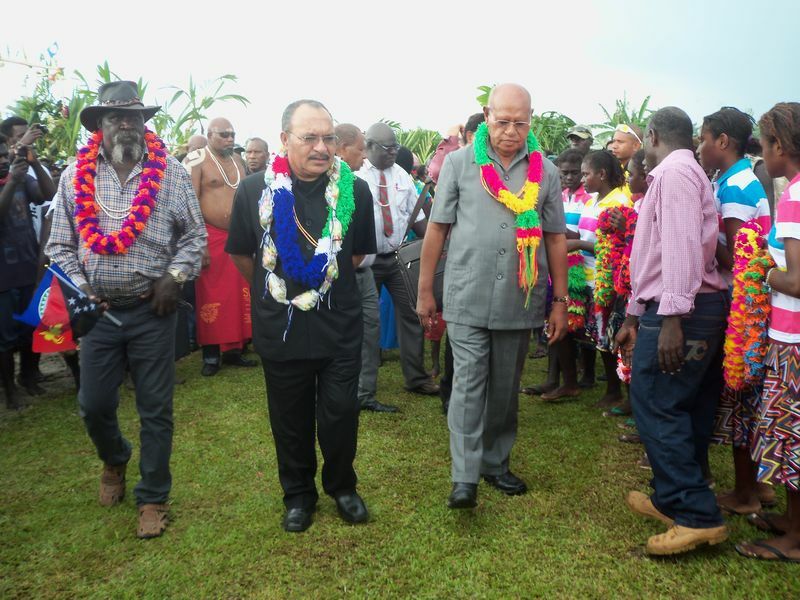 The event marks Tonsu as the first constituency in Bougainville to have set up its branch, thus showing that many people there greatly admire and support the current leadership of President Momis. On top of that, Tonsu will shortly be having permanent executives that will be manning the party’s interest. 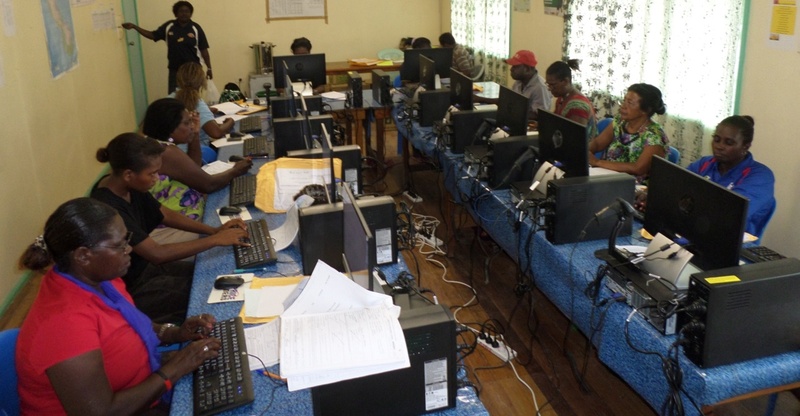 During the 2010 ABG Elections, NBP was only operating on an adhoc basis in the Tonsu area. 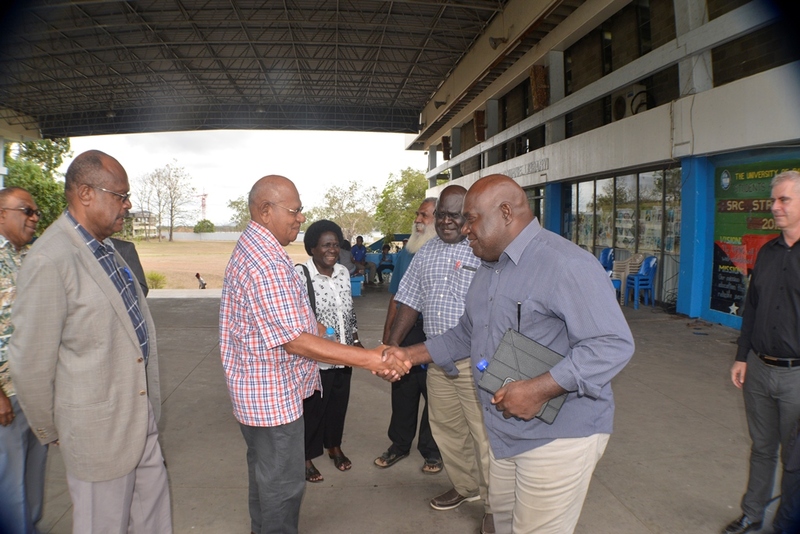 Mr Momis and his delegation included ministers Joel Banam (Public Administration and member for Tonsu), Luke Karaston (Works), Wilfred Komba (Commerce), Rose Pihei (Culture and Tourism), Newton Kauva and others. Financing the Autonomous Bougainville Government according to the Bougainville Peace Agreement and the PNG constitutional laws is not a new program or an option for the National Government. ABG President Chief Dr John Momis made this bold statement during the Joint Supervisory Board Meeting in Kokopo last Friday as he pointed out the National Government’s lax attitude in funding the ABG’s Restoration Development Grant. “My Cabinet and I are getting more and more annoyed when we hear National Government officers and sometimes minister speaking of Bougainville’s requests for funding of the RDG as though these are new claims,” the President said. “Our government’s entitlements are written into the Constitution of Papua New Guinea. Each government may share some blame for not getting this right from 2005, but that does make the provisions any less relevant,” he added. When the Bougainville Peace Agreement was being negotiated the National Government’s finances were in a poor state and the National Government argued it could not afford to provide the massive sums needed to fund recurrent costs adequately and to restore infrastructure and service in Bougainville in what is now known as the Restoration and Development Grant. The National Government team offered the Bougainville parties the rolling five-year average formula based upon the 2001 National Public Investment Program. Their argument was that as Papua New Guinea’s economy improved Bougainville would benefit in the same proportion as the rest of the country, in other words the proportion of the National Development Budget would remain roughly the same as it was in 2001 and the rationale was primarily based around a concept of fairness. Under the RDG;s formulae proposed by the ABG’s share of the domestically financed Public Investment Programme will be around two percent but the formulae proposed by the National Government Bougainville’s share of the Development Budget will reduce dramatically to one third of the share it was in 2001. Since the creation of Bougainville’s autonomous arrangement the RDG has remain stagnant at K15 m per year. The President asked that the JSB seek to agree the RDG formulae and that the ABG want the 2015 paid at the correct rate to maintain services in Bougainville. The Autonomous Bougainville Government has called for the abolishment of the National Coordination Office of Bougainville Affairs (NCOBA). The ABG made a proposal last year that NCOBA and its roles and functions should be reviewed and a joint review on Bougainville’s Autonomy Arrangements, now endorsed by both the ABG and National Government also recommended this. The ABG is of the view that NCOBA should be replaced with a different entity that can better coordinate the efforts of the Bougainville’s state of affairs while also acting as a go-between the ABG and the National Government. A proposed idea is that a Bougainville Government representative office be based in Waigani and to be managed by a Director and staffed by Bougainville public servants to undertake coordination and advocacy with the National Government its departments and agencies. Another option that was raised was the creation of A Bougainville Affairs Ministry, unlike the present ministry that is aligned to NCOBA or there could be a small Bougainville Affairs office within the Department of the Prime Minister and National Executive Council (Policy Division). ABG President Chief Dr John Momis believes that the proposed arrangements can manage its engagement with all National Government departments and agencies and work effectively and efficiently. The current state in which NCOBA operates has come into question due to the fact that it has not been as effective and efficient as the ABG and bureaucracy along with the people can see fit. During the JSB Meeting of this year in Kokopo, the ABG has asked the National Government that the entity be disbanded and allow for the creation of a new entity that will have both influence of governments and allow for clear liaisons between the two governments. New Dawn FM understands that the best time NCOBA was seen as working was under the former Director, BILL DIM who is now in New Zealand. Bougainville News: Does the PNG Government currently owe the Autonomous Bougainville Government over K200 million ? “The PNG government will continue to honour its commitment in releasing K100 million annually for the remaining four years. The national government in 2012 made a commitment to allocate K500 million over a five-year period, to rehabilitate infrastructure throughout Bougainville. 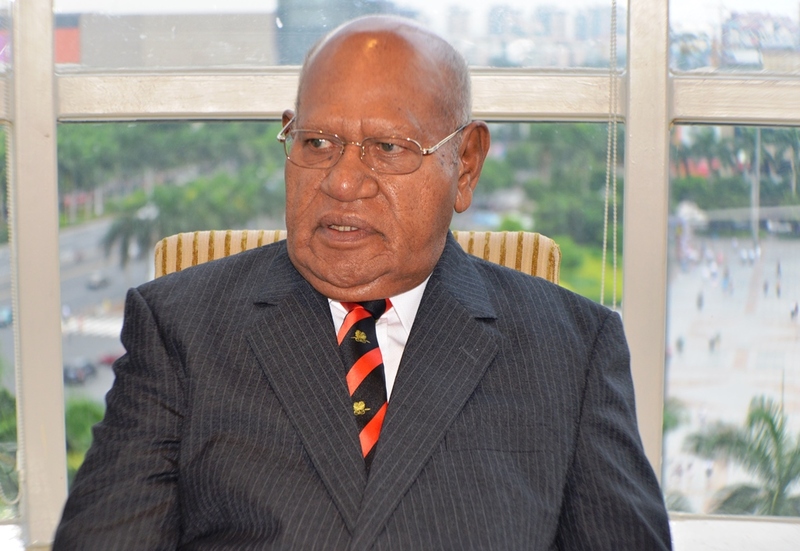 The Papua New Guinea National Government currently owes the Autonomous Bougainville Government over K200 million under the Restoration Development Grants. He told the people who gathered for that special occasion that this money under the Bougainville Peace Agreement belongs to Bougainville but the National Government was underpaying us. He said after calculations were made, ABG found out that the National Government owes us over K200 million. in terms of increasing their funds. 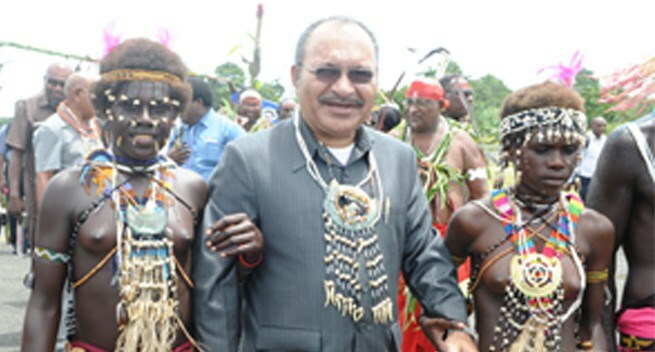 Prime Minister Peter O’Neill today (6/02/14) expressed the National Government’s gratitude towards the leaders and people of Bougainville for their kind welcome and generous hospitality, during his delegation’s recent visit to the region. He said this during an interview on the FM100 Talkback Show, in Port Moresby and outlined the government’s commitment to assist Bougainville with infrastructure rehabilitation funding. “The government will continue to honour its commitment in releasing K100 million annually for the remaining four years. “The national government in 2012 made a commitment to allocate K500 million over a five-year period, to rehabilitate infrastructure throughout Bougainville. “However, despite the first K100 million funding being released, last year (2013), nothing much has been done there,” Prime Minister Hon. Peter O’Neill said. The Prime Minister said the monetary allocation was committed entirely to rehabilitate the rundown infrastructure throughout the region. He also said the funding allocated last year was given to the Autonomous Bougainville Government (ABG) and it is solely responsible for acquitting the funds. “There are also Special Resolution Grants sitting in trust accounts that need to be spent on upgrading infrastructure there,” Prime Minister Hon. Peter O’Neill said. He said with the history of the crisis and loss of lives it was important for the national government to go back and engage with the people of Bougainville and apologize traditionally for all the hardship created, not only for Bougainville but for PNG as well. “I believe these issues could have been better managed before it got out of hand. “It has been an eye-opening experience for a national government delegation which I led into the region recently,” Prime Minister O’Neill said. He thanked the ABG, particularly President Chief Dr John Momis and his Cabinet, along with the four MPs of Bougainville for their partnership and dedication in putting aside their differences and working together to move Bougainville forward. “I also met with the President of the Me’ekamui Government, Philip Miriori, and other leaders including the Panguna landowners like Laurence Daveona and Sam Kaona,” Prime Minister O’Neill said. The Prime Minister reiterated that the government still respects the Arawa Peace Agreement signed in 2001 and looks forward to implementing it. 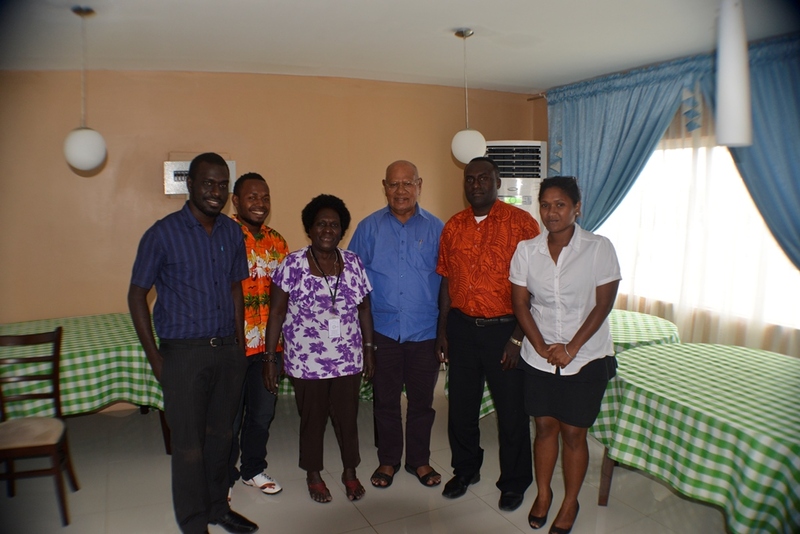 “Our aim of going to Bougainville was to try and restore government services in the region. “We want our hospitals to be functioning well in Bougainville, the roads upgraded and sealed, and the Aropa Airport reopened,” the Prime Minister said. “The government has already opened the Port in Kieta and has re-established PNG Power to distribute power throughout Arawa town,” Prime Minister Hon. Peter O’Neill announced. He says the lack of money is stalling preparations for the referendum on possible independence, which is a key part of the Bougainville Peace Agreement. 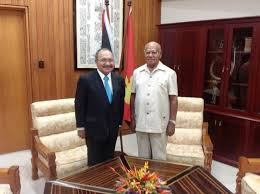 That vote is likely in 2016 and Mr Momis told Don Wiseman Bougainvilleans need to be more self reliant or seek financial help elsewhere if the national government does not meet its commitments. JOHN MOMIS: The people of Bougainville must realise that that event, that important political moment in the history of Bougainville is quite imminent. As a matter of fact, next year the ABG, their own house of representatives, will determine the actual date of the referendum. So whilst we’re experiencing a lot of problems in respect to assistance from the national government, we need to get ourselves organised and be more self-reliant, even in terms of sourcing funds from outside. Because we are not having a very successful engagement with the national government. They seem to be having no qualms or conscience and consistently breaching the Bougainville Peace Agreement. So the only way to motivate our people is to say, look, we have to be ready. It’s like saying the grand final date is on, and, whether we are ready or not, we have to play in the grand final. We made the commitment so we better get ourselves organised. DON WISEMAN: When you say that the national government is breaching the peace agreement, there was a lot of good feeling toward the end of last year and the government came through with those very large commitments they had made. So are you suggesting there’s been a backtracking since then? JM: There’s been quite a bit of backtracking, yes. Even last year the $100 million the government promised only came to us in November towards the end of the year. It doesn’t give us much time to implement, especially when the Bougainville administration doesn’t have the capacity. And this year, we haven’t go this year’s allocation yet. And the restoration and development grant, which is stipulated in the Bougainville Peace Agreement, which is sub-constitutionally guaranteeing the allocation of funds which should be given to us every year – they have been under paying us deliberately. We worked out that, in fact, the national government owes us something like approximately $188 million. That is the only guaranteed funding to Bougainville. They’ve been severely underpaying us. DW: And that’s separate from the commitment of 500 million kina that was made?